This Saturday, the Swedish Film Institute had the decency to screen a 70 mm copy of "That's The Way It Is" in a cinema in Stockholm. As I nowadays live in a smaller city a long way from the capital, I wasn't able to make it. A shame really, as I have only seen a real Elvis movie on the big screen one time before, (if you don't count "This Is Elvis"). But I find comfort in the fact that it was "King Creole" that I saw. It must have been in 1985. Since it was 50 years since Elvis was born a cinema in Stockholm showed "King Creole" and "Paradise, Hawaiian Style" for a couple of nights. 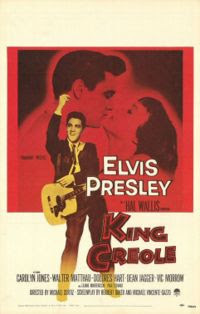 "Paradise, Hawaiian Style" was one of the few Elvis films I had seen on TV, so I choose "King Creole" instead. I clearly remember arriving at the cinema only a few minutes before the film was to be shown, and nervously asking if there were any tickets left. Yes, was the reassuring answer and I happily payed for my ticket. I shouldn't have worried. No more than three or for other persons were in the movie theatre with me. For some reason I thought that a little embarrassing, both for me and Elvis. But those feelings quickly disappeared as the opening credits started to appear on the screen together with that big paddle-steamer. Finally I was watching an Elvis movie in a real cinema. And I found myself thinking about how proud I was over being an Elvis fan. It sounds silly, but in those days you had to fight for Elvis. In my school it wasn't easy being an Elvis fan and it took guts to wear an Elvis badge. But sitting there in the dark cinema, I knew I was doing the right thing, sticking to Elvis. Here was proof, if needed, that Elvis was the greatest entertainer ever, and that someday, more people around me would realise that. And they did. Today it's another ballgame all together. It's kind of cool to like Elvis, and certainly nobody thinks it's strange. But that was something I didn't know in that movie theatre 22 years ago. Nice retelling of your memories! "Bubba Ho-tep is dead to me"
Viva Las Vegas - Dinner or Midnight Show? "Can't tell if it's comedy or drama"
No put luck with Girls! Girls! Girls!